At Wedding Sparklers Outlet, we have added a couple of new products for you to consider as you look at gender reveal and wedding exit ideas. For a long time, we have offered a selection of confetti cannons for weddings, birthdays, gender reveal parties and many other celebrations. And, we have talked about the benefits of buying wedding sparklers to add a touch of romance and magic to your special day. In fact, one of our most popular wedding exit ideas has long been to use sparklers to create an illuminated walkway for the bride and groom to pass through after the ceremony. It creates a beautiful effect at dusk or at night; but what if your wedding is early in the day? To give you more options and to kick things up a notch, we have added new types of confetti cannons to our inventory, perfect for your exit (and some perfect for your gender reveal). We now offer a gold metallic streamer cannon, perfect for shooting out elegant mylar streamers over the bride and groom as they exit the church or the reception. Imagine the photos as your guests shoot their cannons 15 feet into the air and it “rains” gold streamers all over the new couple! The second is a cannon that shoots out a white or multicolored confetti over the top of the happy couple and guests, but the beauty is - the paper in these cannons is water soluble! 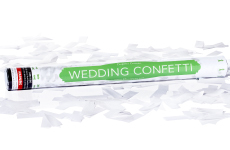 Our Eco Wedding Confetti Cannons feature biodegradable, water-soluble tissue paper confetti, eliminating the need for cleanup beyond washing them all away with a garden hose. No more concern over messy cleanup after the party. The third new product, for our gender reveal customers, combines two of our favorite gender reveal products - powder cannons and confetti cannons. We now have a cannon that shoots out a mixture of colored confetti and powder that showers the mom- and dad-to-be (and, of course, all the guests) with the color of their baby’s gender. It is available in pink and blue. Also, note that both the confetti and powder used in these cannons is biodegradable and can fire up to 15 feet in the air when the base is twisted. These confetti/powder cannons use a charge of compressed air instead of any form of pyrotechnics to fire the mixture. This makes them perfectly safe for use indoors or outside. While there is nothing wrong with buying wedding sparklers for your exit and we highly recommend it, you can also make use of our confetti cannons here (and to reveal the gender of a baby). Imagine showering the bride and groom with confetti and streamers on the dance floor as they share their first dance as a married couple! Use your imagination (let it run wild) and order a supply of wedding sparklers and confetti cannons to add the final touch to your gender reveal party or wedding plans at Wedding Sparklers Outlet. Be sure to order early to make sure you have everything you need in time for your special day.